Unfortunately (or thankfully? ), I am experiencing a game-breaking glitch, which has been preventing me from finishing the game. Adam goes into the subway, and never comes out. It’s quite sad. But, on the bright side, this bug is prolonging the magnificent stealth-action gameplay. 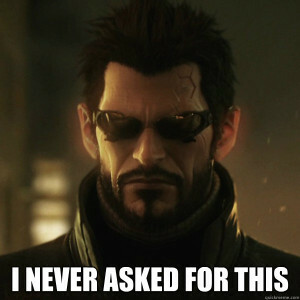 For a few more days, before the deities at Eidos lovingly gift me the patch that will save my poor subway-trapped Adam Jensen, the game is uncompleted. I have time to step back and take a breath before the game sinks its teeth back into me, and addiction takes hold once more. That’s pretty cool, isn’t it? Or am I just rationalizing a horrible, horrible fate? Hope you enjoyed this 100 words or less article! Are you playing Deus Ex: Mankind Divided? What are your thoughts? Have you encountered any game-breaking (yet life-affirming) bugs? Tell me in the comments below!